It is summer time, so my thoughts have naturally turned to salads. I love salads that are a whole meal. Don’t get me wrong, I’m fine with green salads, but I tend to think of them as a side dish, rather than the main event. This is one of my favourite substantial salads. I sometimes vary what goes into it, adding spinach or some other leafy green, but the chickpeas and either roasted sweet potato or pumpkin are always a constant. I roast vegetables on a cooler day in summer so that they are ready in the fridge for using in salads. If I have some veggies already roasted, it makes it very quick to throw this or any other salad together. The dressing is what makes it so delicious. You could probably use it with any firm vegetable and it would work. The dressing has all those special Thai hot, spicy, sweet and salty notes that make everything taste good. I took this recently to a family meal and it was a big hit. 1 400 gram can of chickpeas, or equivalent amount of home cooked ones. Peel and dice the sweet potato into 1-2 cm chunks. Roast them in the oven with the smallest amount of oil until just tender. Allow to cool. Remove the hard outside layers from the lemongrass until you have just the tender part. Remove the seeds from the chillies unless you like things really hot. Add the lemongrass, chillies, fresh coriander, kaffir lime leaves to a mortar and pestle and pound to a rough paste. It doesn't matter too much if there are occasional chunks in it. Stir in the coconut milk, the 'fish' sauce and sugar and add as much lime juice as you need to taste. You can keep tweaking it with more lime juice, 'fish' sauce and sugar until it tastes how you like it. 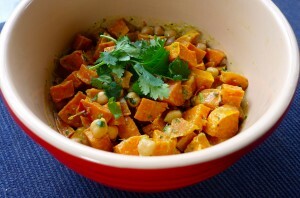 Mix the dressing into the chickpeas and sweet potato and garnish with extra coriander leaves. that looks really tasty, I haven’t had sweet potato for ages, not in season here! Hi Cate. It works well with pumpkin too, and I can’t think of any reason why it wouldn’t work with other roasted veg.